This is Jungle Comics # 61. No missing pages or cut-outs. Piece out at top left corner of front cover. Small pieces out at top corners and near left corner of back cover. The one near the corner runs through the last 6 interior pages. Jo-Jo Congo King #21, Fox Comics. Bottom right corner of front cover is torn. Bottom 1/3 of spine is split on the cover and there is a tear on the back cover. 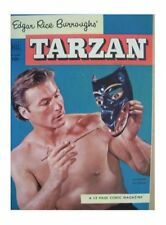 Tarzan In The Ivory City #19 Edgar Rice Burroughs 1952 Good Condition. Shipped with USPS Priority Mail. Good Girl Art; Sheena Story. JUMBO COMICS #60. FEBRUARY 1944. These strict standards are well-developed and widely accepted. We hate when it happens to us and will do our very best to make sure we don't do it to you. Sorry, USA only, no exceptions. We have been serving collectors since 1982. We have a spotless record for integrity and service. We are always interested in buying quality collections. Lee's Comics. Grade: GD 2.0. Published 1954 by Fiction House. This is a low grade item. The story will be complete and readable, butthe item itself will have major defects. of comics, generally about 25-40 comics depending on page count. Contains a delightful Sky Girl story with art by the incomparable Matt Baker. Sorry, USA only, no exceptions. We have been serving collectors since 1982. We have a spotless record for integrity and service. SHEENA QUEEN OF THE JUNGLE #5. Good Girl Art; Matt Baker Cover?. These strict standards are well-developed and widely accepted. We hate when it happens to us and will do our very best to make sure we don't do it to you. Cover art by Joe Doolin. "Terror Raid of the Congo Caesar!". Untitled story, art by August Froehlich; A witch secretly poisons the local water hole and uses the death of the animals to convince her tribe that she is very powerful; However, Simba attacks her and she falls into the water hole and dies of her own poison. Good Girl Art; Sheena Story. 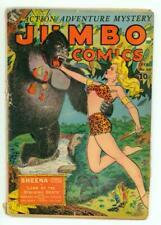 JUMBO COMICS #61. MARCH 1944. These strict standards are well-developed and widely accepted. We hate when it happens to us and will do our very best to make sure we don't do it to you. Cover art by Joe Doolin. Untitled story, art by Henry Kiefer; Wambi frees Ogg and other jungle animals captured by disreputable hunters. "Jungle Monarch" text story, art by Richard Case. Untitled story, art by George Tuska; A witch doctor poisons the water of the Dwanda village in order to drive the tribe away so a neighboring tribe can take their land. Good Girl Art; Sheena Story. JUMBO COMICS #48. FEBRUARY 1943. These strict standards are well-developed and widely accepted. We hate when it happens to us and will do our very best to make sure we don't do it to you. Grade: GD 2.0. "Gorilla City!". Congo Bill and Janu encounter a village filled with talking gorillas who are actually Martians. "Bombo?the Rage of London!". Bombo the Rogue Elephant goes to London. Also includes: "The Jungle Trolley Car! Cover art by Joe Doolin. "Fire-Birds from the Sky! "., art by Ruben Moreira (as Rubi Moore); Bronson, an unscrupulous con man convinces the Tulagis that he commands the sky gods, using hot air balloons in his deception; Kaänga exposes him and watches him fall to his death. Art by Robert Webb. Cover by Dan Zolnerowich. Adventures of the fearless jungle warrior Sheena, one of the earliest female heroes with her own title. Twan the Moon Princess threatens Sheena with a deadly black orchid; Sheena and Bob encounter Nazi agents in the jungle; A strange vampire cult threatens to take over a native tribe. Art by Robert Webb. Cover by Robert Webb. Adventures of the fearless jungle warrior Sheena, one of the earliest female heroes with her own title. Vultures of the Veldt; They Claw by Night; The Guard of Dead Man's Ravine; Jumbo of the Elephants. Grade: GD 2.0. Published 1949 by Fiction House. of comics, generally about 25-40 comics depending on page count. We buy tens of thousands of comics a month. We buy everything from large collections and estates to individual high value Golden Age and Silver Age books and everything in between. Cover pencils by Maurice Whitman. "The Animal Trainer" text story by Clyde Beatty. Untitled story, art by Henry Kiefer; Wambi senses that the local volcano is about to erupt, and he warns his animal friends to flee; Sirdah the Tiger is skeptical and resists; The rest of the animals comply, but run into a hunting party; Sirdah accuses Wambi of leading them into an ambush. CONDITION: GD (2.0) COVER SPLIT 3/4 WAY, 3" TEAR BACK COVER. THE BOOK IS COMPLETE WITH VIVID COLORS. WILD BOY #2 (1952). GRADING: Grading can be subjective so our grades may not necessarily match up exactly with yours. Jungle Action #3. Condition: Good. In addition to the flaws visible in the scans, the cover is attached at only one staple and the centerfold is detached. The grade is my opinion, based on 30 years of collecting. Grade: GD 2.0. We buy tens of thousands of comics a month. We buy everything from large collections and estates to individual high value Golden Age and Silver Age books and everything in between. of comics, generally about 25-40 comics depending on page count. Grade: GD 2.0. Published 1949 by Fiction House. of comics, generally about 25-40 comics depending on page count. We buy tens of thousands of comics a month. We buy everything from large modern collections to individual high value Golden Age and Silver Age books and everything in between. Art by Wally Wood and Bill Everett. "Tat'teeta and Jungle Justice" text story reprinted from Jo-Jo Comics (1945) #26. 32 pages, Full Color. Grade: GD 2.0. Published 1950 by Fox Feature Syndicate. This is a low grade item. "King Fang"; Kaänga's ape friend, Koonda is taken captive by hunters; Kaänga frees him and follows him back to his band where Koodna must fight to re-establish himself as king. "The Courage of Kaambi" text story by John Lindstrom. 1952 Fiction House MagazineSheena Queen of the Jungle #16 Published 1952. Small amount of wear. 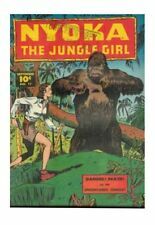 Fawcett Publications 1951 Nyoka The Jungle Girl No. 62. May or may not include 3-D glasses, see individual item notes. Maurice Whitman cover. In order of appearance: "Sheena, Queen of the Jungle" art by Robert Webb, reprinted from Jumbo Comics (1938) #87; "The Great White Lion"; "Tabu" art by Howard Larsen, reprinted from Jumbo Comics (1938) #64; and "Sheena, Queen of the Jungle" art by Robert Webb, reprinted from Jumbo Comics (1938) #79. Grade: GD 2.0. Published 1952 by Fiction House. of comics, generally about 25-40 comics depending on page count. We buy tens of thousands of comics a month. We buy everything from large modern collections to individual high value Golden Age and Silver Age books and everything in between. WILD BOY #7 - GD 2.0 - ZIFF 1952 - KINSTLER ART - ONLY $10.95 B.I.N. ! Art by Jay Disbrow and Lena Buffalente. Cover by Maurice Whitman. Adventures of the fearless jungle warrior Sheena, one of the earliest female heroes with her own title. The Skull Wearer of A'Wando Grotto; The Ivory Smugglers; King of the Congo; An Ironical Turnabout; Secret of the Snake Queen. Grade: GD 2.0. Cover art by Maurice Whitman. Untitled story, art by Henry Kiefer; Wambi frees a Cape buffalo from a tangled mass of vines; Later, Sirdah attempts to kill Wambi; He is stopped by the grateful Cape buffalo who learns of Wambi's plight from a macaw. Grade: GD 2.0. Published 1952 by Magazine Enterprises. This is a low grade item. The story will be complete and readable, butthe item itself will have major defects. of comics, generally about 25-40 comics depending on page count. Cover art by John Celardo. "Hate Has a Thousand Claws!". Ann, however, remains in a drugged state. Untitled story, art by Charles Sultan; A fake lancer steals a tribal treasure map; Terry pursues him and demonstrates to the Balongas that the lancers were not guilty of betrayal. Grade: GD 2.0. Published 1954 by Fiction House. "N'Gagi the Terrible"; Three treasure hunters plot with the Manzanis' witch doctor, Moroto, using a projection of a giant ape, to steal the Manzanis' treasures; Ann exposes the fraud, and Kaänga pursues the criminals, capturing them and restoring the treasure. Grade: GD 2.0. Published 1948 by Fiction House. of comics, generally about 25-40 comics depending on page count. We buy tens of thousands of comics a month. We buy everything from large modern collections to individual high value Golden Age and Silver Age books and everything in between. Art by Robert Webb and Frank Riddell. Cover by Maurice Whitman. Adventures of the fearless jungle warrior Sheena, one of the earliest female heroes with her own title. The Veldt of Voodoo Lions; The Fuzzy-Wuzzies; Kaanga; Sheena, Queen of the Jungle. 52 pgs., full color. Grade: GD 2.0. Published 1950 by Fiction House. of comics, generally about 25-40 comics depending on page count. We buy tens of thousands of comics a month. We buy everything from large modern collections to individual high value Golden Age and Silver Age books and everything in between. Cover art by Joe Doolin. "The Valley of the Seven Idols!". Untitled story, pencils by Robert Webb; Wambi prevents the sacrifice of a young woman by the Scorpion Killers and sees to it that their priest is himself killed by a scorpion. Jungle Adventures #15 GD (Super Comics 1964) Ka'a'nga & Tiger Girl!